The control of your heart rate is regulated by two mechanisms within your nervous system: the sympathetic system increases the rate and the parasympathetic decreases the rate. Sodium and chloride outside the cells and potassium inside the cells work together to initiate the nerve impulse conduction that causes muscle contractions. Your kidneys balance the necessary levels to maintain, within a narrow margin, a normal heart rate. Sodium can be ingested, inhaled or administered intravenously. Primary symptoms associated with too much or too little sodium affect the nervous system and include confusion, lethargy and muscle twitching. Alterations in sodium are connected to changes in the amount of water in the blood because sodium draws water. Decreased sodium lowers blood volume, causing the blood pressure to drop and the heart rate to increase. Sodium increases raise blood volume and cause fluid to accumulate, forcing your heart to work harder. 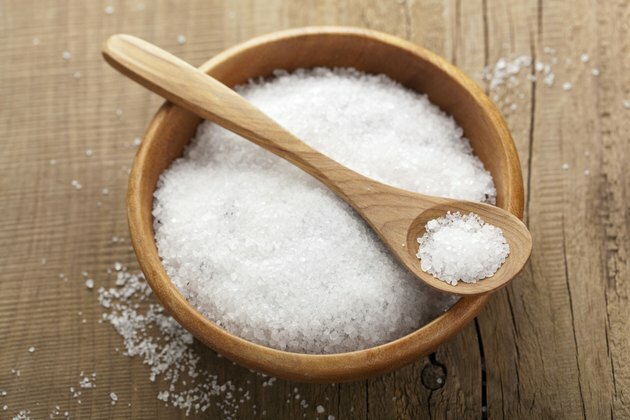 Sodium chloride, the chemical name for salt, is used in food processing and manufacturing and accounts for about 75 percent of the salt intake in the United States, according to Linus Pauling Institute. The balance is partially attributed to table salt use and seasoning while cooking. You might notice increased sensitivity to sodium's side effects if you are black, diabetic, have chronic kidney or heart disease or as a result of aging. Sodium chloride solution is used to induce sputum production for medical testing. Sputum, produced in your lungs, is a valuable diagnostic tool when analyzed for bacterial or viral content. Sodium side effects include confusion, difficulty breathing, muscle spasms, fatigue, chest pain and heart irregularities. Heart failure or disease, hypertension, kidney disease, edema and low-salt diets might preclude use. Medications to open airways, avoiding bronchospasms, or muscle contractions in the airway, might be necessary before use. Intravenous sodium chloride treats hyponatremia, or low sodium, if your lab values are dangerously low. Causes include diuretic use, diarrhea and vomiting, heart failure, kidney disease and water intoxication. Sodium levels are brought back to normal through intravenous infusion, restricting water, increasing urine output and treating the cause. Hypernatremia, or high sodium, occurs with kidney and heart disease causing increased heart rate, elevated blood pressure and fluid retention, with treatment directed at the underlying cause. If you have fluctuations in sodium levels, the symptoms you experience might be altered by medications for pre-existing diseases, such as kidney, nervous system, heart and psychiatric conditions. Antihypertensives, for high blood pressure, medications to control heart rate, diuretics to reduce fluid retention and pacemakers can mask cardiac symptoms. Laboratory blood testing is used to reveal sodium levels along with a thorough physical assessment to achieve an accurate diagnosis. What Causes Your Sodium Levels to Drop?